MRP Design Group has just completed work on a new prototype restaurant design for Zaxby’s. The new design which is an adaptation of a concept created by Zach Mcleroy, CEO and cofounder of Zaxby’s. 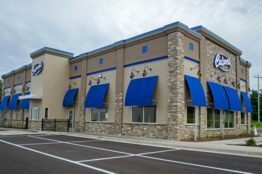 The new design not only has a new exterior look it also has a completely new kitchen design developed with input from some of the most experienced licensees in the Zaxby’s network. While it is too early to share details check back in the next few months for additional info and photos of this unique concept.